Collagen is perfect for the ketogenic diet as they allow you to increase muscle & tissue repair and recovery without you having to consume too much protein, which can knock you out of ketosis. 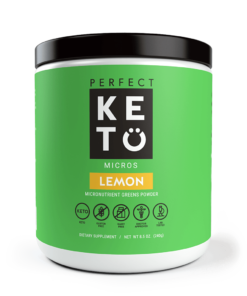 Stay in ketosis with collagen! The world’s first 100% Pure Bovine Collagen Peptides in plastic free, fully recyclable packaging. WHY OUR 100% BOVINE COLLAGEN PEPTIDES? With one simple ingredient, our easily digestible and highly bioactive 100% Bovine Collagen Peptides could be considered the ultimate functional and evolved protein source available. Our collagen peptides are produced using an innovative alkaline, water based process without the use of solvents or other contaminants, ensuring you benefit from all 18 amino acids* that collagen peptides provide. *contains 8 essential amino acids that we must consume as our bodies do not make them. Collagen is a key structural protein that ensures the cohesion, elasticity and regeneration of all our connective tissues – as we age, our collagen levels start to drop. By supplementing your real food diet with collagen, you are supporting healthy hair, strong nails, plump skin, muscle repair, healthy joints and is especially useful in aiding recovery post exercise. It’s another step in becoming the best version of yourself. FREE FROM – ALLERGEN FREE PROTEIN! Our collagen is completely free from the top 14 allergens including gluten, soy, dairy and nuts and contains absolutely no sugars, artificial flavours or thickeners. What’s more, every batch is lab tested to ensure it is free from heavy metals, toxins and microbes with no solvents ever used in our processes. IS YOUR COLLAGEN GRASS FED? Transparency is one of our founding principles as such we did not want to use the term ‘Grass Fed’ on our packaging. Yes, we could have done as the cows certainly are fed grass. However, during our search to source the finest Collagen Peptides, we could not find any source that could 100% guarantee that supplementary feeds are not used during the wintertime. This is the fact worldwide and as such, any collagen that states 100% Grass Fed is very likely not accurate. Unflavoured and easy to dissolve in both hot and cold drinks, our collagen can be added to any smoothie, beverage, soup, sauce or real food meal without adjusting the taste. Great in water, coffee or even sprinkled on top of our avocado oil mayonnaise for a protein kick – you got it! It is recommended that between and 10g to 30g daily is taken daily. This is dependant on your individual lifestyle and circumstances. This bag is designed for 1 months supply at 2 tablespoons / 13g per serving daily. It’s pretty darn obvious, but food supplements are not designed to replace a real food, varied lifestyle and diet. Simply roll over the top of the bag or use a clip to seal the bag tightly. We didn’t want to use a plastic seal – we hope you can appreciate why. Caring for the environment and its people is one of our founding values. By using this innovative, 100% plastic free, and recyclable paper bag, we are not contributing to the plastic pollution that is epidemic in today’s world. As you can imagine, we’re very proud of this.